2300+ local tips on where to eat, drink and shop, where to go and where to see. Please understand and keep quiet especially after 10:00 PM. All musical instruments, stereos, radios, and your voice volume etc, should be at a volume that won’t disturb the neighbors. Japanese people are very sensitive to sound. Do not throw away outside home. We get a fine from the city if we don’t recycle properly. Japan is very strict about dispose household garbage. Please be sure to separate the garbage, and do not mix burnable and non-burnable, paper, plastic and metal items are all recycled. No smoking inside and outside of near house please. Smoking related damages including smell from tobacco smoke will require cleaning and repair, with relevant fees assessed. Throwing cigarettes around the apartment is strictly prohibited. 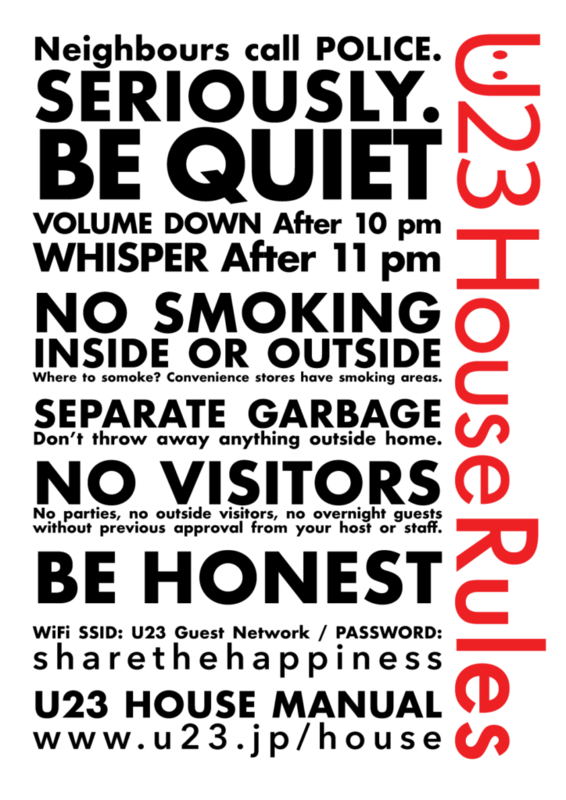 No parties, no outside visitors, no overnight guests without previous approval from your host. Please take your shoes off before entering the house and use the slippers. Please keep room clean and tidy. Please wash any dishes you use and try to leave the apartment in about the same condition as when you arrived. When you leave the apartment or the bath, turn off the lights and the air conditioner. We want to help the environment. If you break or damage something, please let us know. You are FRIENDS of ours. Feel like your home. Treat like your home.